Several residents have expressed concern over poor water quality over the winter months. Issues include a build up of oily deposits in certain areas and a distinct green water colour combined with poor clarity. The issue was raised with council who have investigated and provided the following information which gives an insight into the processess effecting the lake. Thank you for your enquiry with regards the current water quality of Lake Hugh Muntz. As you may be aware, the Catchment Management Unit undertakes an in-depth water quality analysis of the lake on a monthly basis to monitor for trends in water quality, and also to monitor the effectiveness of the floating reed beds. The City of Gold Coast also undertakes a water quality survey on it’s recreational water bodies (RecWaters) on a weekly basis, of which Lake Hugh Muntz is part of. Based on our current water quality data and anecdotal observations it appears Lake Hugh Muntz shows signs of exhibiting a ‘halocline’ within the water column. This can occur when the body of water is brackish (mix between fresh and salt water) and when a distinct vertical salinity discontinuity (barrier) occurs at a certain depth (currently at 5 metres in Lake Hugh Muntz). When a halocline forms, vertical mixing of nutrients and oxygen between the water layers above and below the halocline becomes limited. As dissolved oxygen is unable to move below the halocline, the water layer below becomes depleted of oxygen (anoxic) due to biological activity which in turn allows nutrients in the sediment to become available to the water column through anaerobic activity. Based on the bathymetry map below it can be seen that Lake Hugh Muntz is up to 12 metres deep on the western side of the lake. 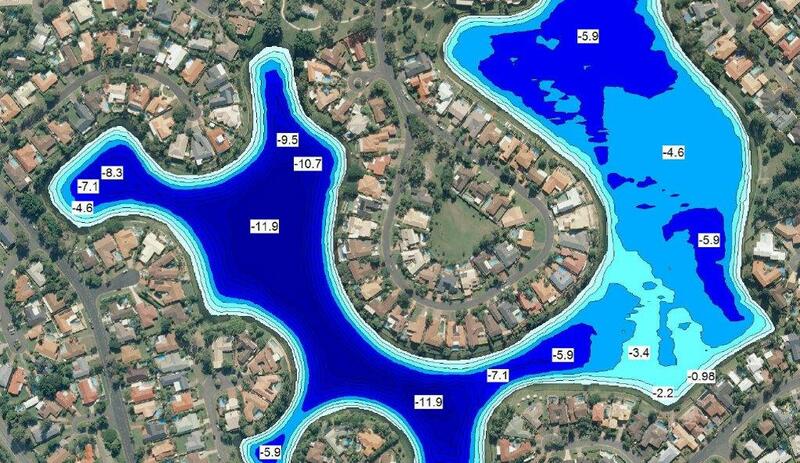 Water quality assessment undertaken by the City of Gold Coast indicates that this area of the lake is oxygen depleted below the halocline and that nutrients are high in the lower layers (10 -11 metres deep). These nutrient rich deeper layers are able to come to the surface during the colder months when surface waters become colder than that of the deeper layers. As colder water has a higher density then the warmer deeper layers, the top surface waters sink to the bottom (breaking through the halocline) and the warmer water rises to the top, essentially ‘flipping’ the lake and bringing the nutrient rich waters from the oxygen depleted lower layers to the surface. When these nutrients are brought to the surface, algal blooms can occur if no other aquatic vegetation is present to take up the nutrients. This process is a natural occurrence but can be exacerbated when nutrients flowing into the water body from the surrounding catchment are also high (such as an urban environment). Therefore sources of nutrients are available to algae not only from internal sources such as the lake sediment but also from external sources such as stormwater outlets, fertilisers from gardens and grass clippings etc. Organic matter such as leaves, twigs, grass clippings and other vegetation can often been seen floating on the surface of Lake Hugh Muntz and can collect in certain corners of the lake depending on the wind direction of that day. This organic matter is usually at different stages of breaking down so can often result in a brown scum on the surface which can become more evident when pushed to one side of the lake during strong winds. Courtesy: City of Gold Coast- Catchment Management.